When the going gets tough, I get trudging. With all of the snow and wind we’ve had recently, I spend a lot of time trudging. 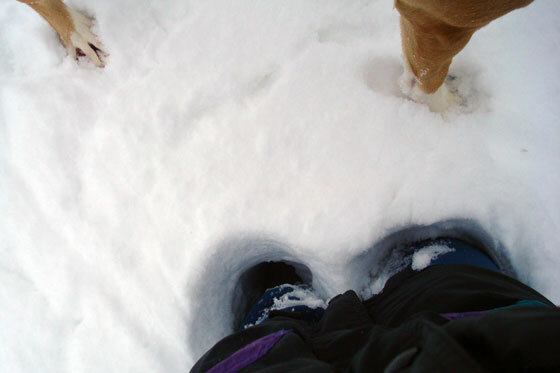 In the photo below, I am up to my thighs in the snow, while Baxter the lucky dog lightweight stands on top. When the going gets tough, Baxter gets hopping. He makes like a bunny and bounds through the snow. Sure, sometimes he lands in a drift that’s over his head. There’s a moment while he ponders the injustice of the situation and how he came to be buried up to his ears. However, then he gathers himself together and makes a larger leap, charging on through the snow. Other times, he embraces the drift and dives in deeper, searching for real live bunnies. This week, when work has been particularly hectic, when things seem to be much more difficult that they need to be and when I’m feeling particularly frenetic, a dog’s enthusiasm and joy for life are good lessons. How’s your week going? Anyone else enjoying/dealing with particularly deep snow? What lessons have you learned from your pets? Today my dog jumped in the pond at the house where I was teaching (yes, I took my dog to a piano lesson. Long story.) His legs got completely black, and he’s a giant white dog. Later, he went running through the dark and it looked like he was flying because I couldn’t see his legs at all! I’m not sure what kind of life lessons I should take away from that, maybe things are not always what they seem? We went to my parents’ house today and had a walk in “civilization.” Baxter was over the moon. The sniffiness of all of the doggies who had gone before was very exciting. Aww, good boy Baxter! He is so cute! This makes me miss the snow. Ace would bound through the snow like that too but his was a wimp and would usually start lifting his paws up right away.